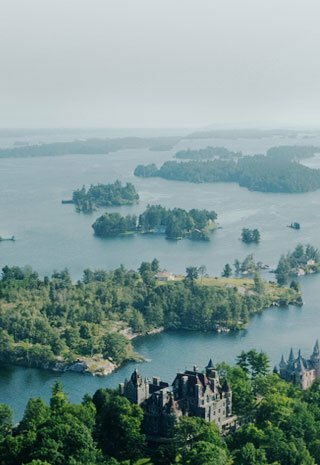 It’s no secret that The 1000 Islands region is one of the most astonishing natural spectacles on Earth. Over the centuries, the St. Lawrence River has been the subject of countless stories, legends and pivotal historical events. A vital artery for transportation and commerce, the river and immense St. Lawrence Seaway represent a key terminus for both Canada and the United States. 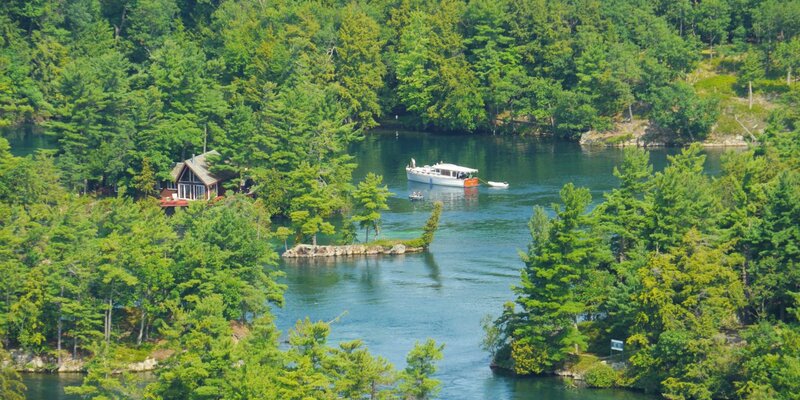 The 1000 Islands are also a fabled destination for travellers, and adventure seekers from all corners of the globe. 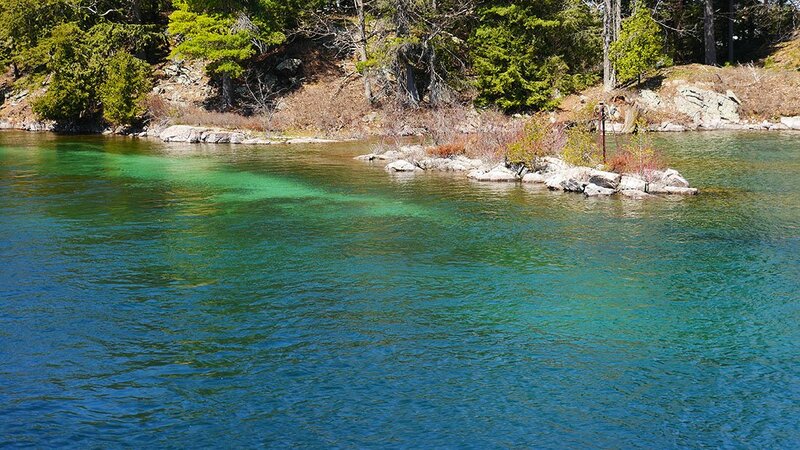 The St. Lawrence River is home to over two hundred (known) shipwrecks and presents an irresistible wonderland for scuba divers of all skill levels. For history lovers, the region is bursting with intrigue as there are countless mysteries and fascinating stories to uncover both above and below the waves. 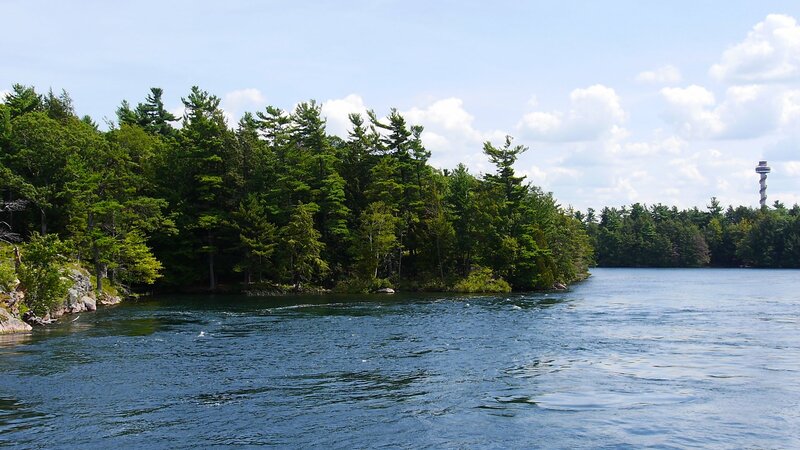 Above all, however, The 1000 Islands is best known for the sheer natural beauty of the surrounding land. At every turn, you are met with a captivating variety of panoramic views – and seemingly unending vistas of emerald forests and shimmering water. There really is no place on earth quite like it. 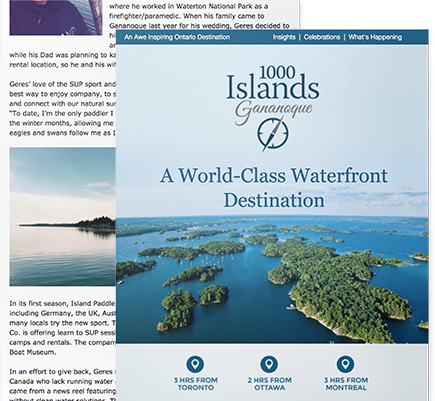 For this story, we planned out a packed day-trip to Gananoque Ontario – to offer our readers a great introduction to the area, while allowing us to experience and rediscover the unforgettable scenery that put The 1000 Islands on the map! 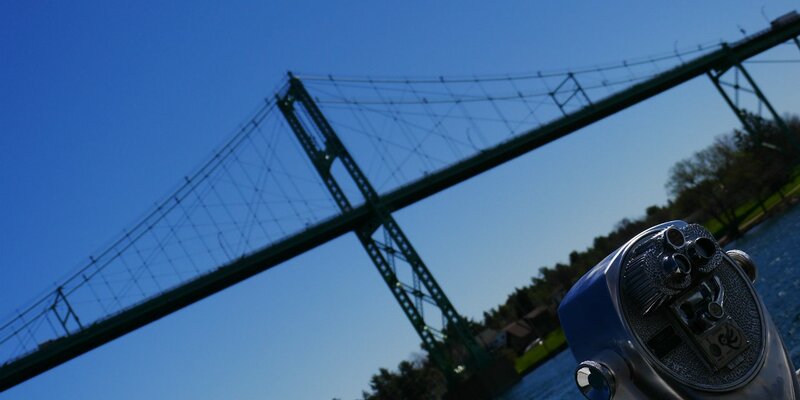 We kicked off the day with a scenic river cruise, courtesy of Gananoque Boat Line. The sun was shining brightly amid a stunning blue sky as we stood at the dock waiting for our vessel to arrive. The water’s surface was calm and pristine, capturing the sun in a brilliant and radiant cascade of mid-morning light. 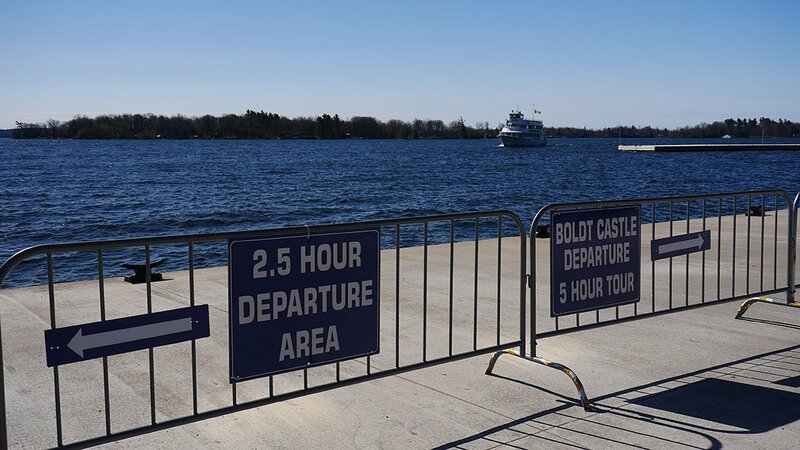 We would be embarking on the Lost Ships of The 1000 Islands Cruise, a fascinating two and a half hour journey past Wellesley Island, through the river’s famous Millionaire’s Row and a slow lap around the beloved and world famous Boldt Castle. This popular tour showcases a selection of famous shipwrecks combining the scenic surroundings of the cruise with video displays that show passengers sonar images and other interesting information. Throughout the Lost Ships cruise, I was fascinated with the stories and images tied to the tour but also fixated on the brilliant scenery surrounding our ship. 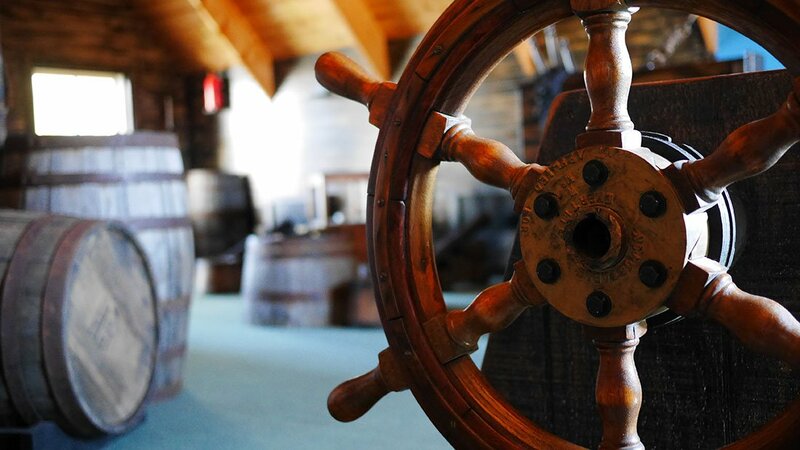 As we gracefully cruised along our course we were told several amazing stories of the region’s expansive history that I won’t spoil for you here. 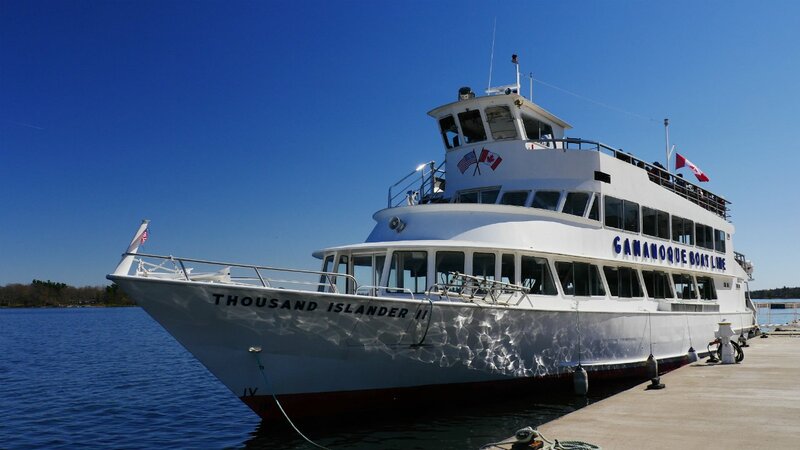 What I will tell you, is that there is no better way to get introduced to The 1000 Islands than with an unforgettable voyage aboard a tour vessel. 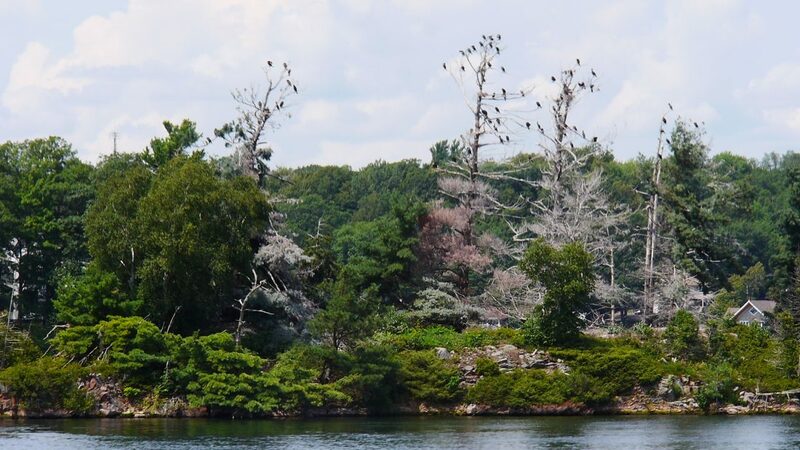 The experience we enjoyed with Gananoque Boat Line was absolutely brilliant. The Lost Ships cruise is just one of several adventures to choose from and Heidi and I can’t wait for the next time we cast-off for another voyage on the water! Once we completed our cruise and returned to dry land, it was getting pretty close to lunchtime. To satisfy our appetites we set our sights on The Old English Pub – Downtown Gananoque’s source for proper pub-grub and of course, a dazzling selection of Ontario Craft Beers on tap. This quaint public house sports a sleek forest green facade styled in the fashion of landmark tap houses found in The UK. Inside the pub is a cozy and inviting interior with plush booths, varnished tables, and soft lighting. 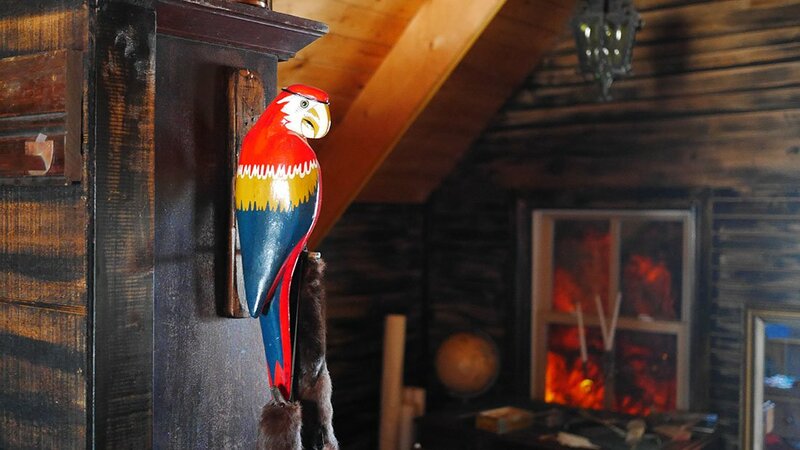 The walls are adorned with various images, curios and other items of decor one would expect complete with a portrait of Winston Churchill himself gazing out from above the mantle. 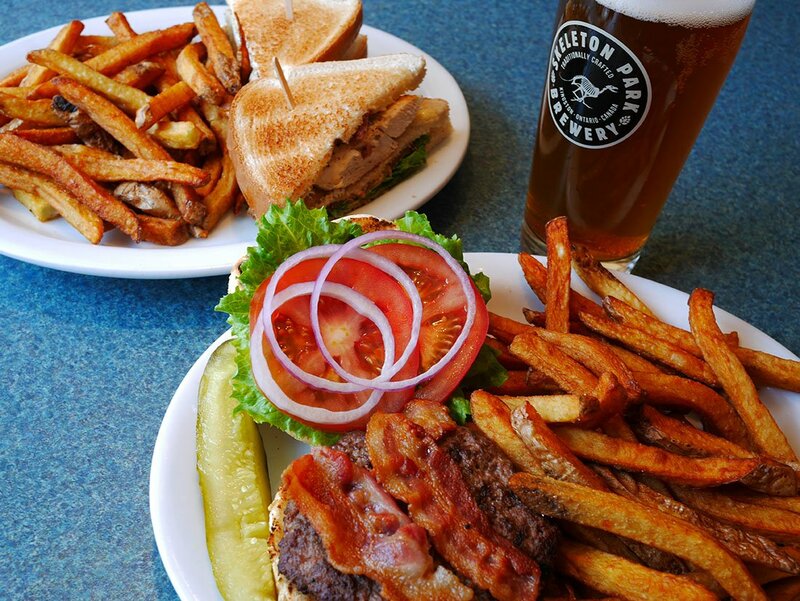 After a quick review of the menu, Heidi had the Old English Banquet burger – a traditional crowd pleaser topped with lettuce, tomato, red onion, as well as cheddar and bacon. 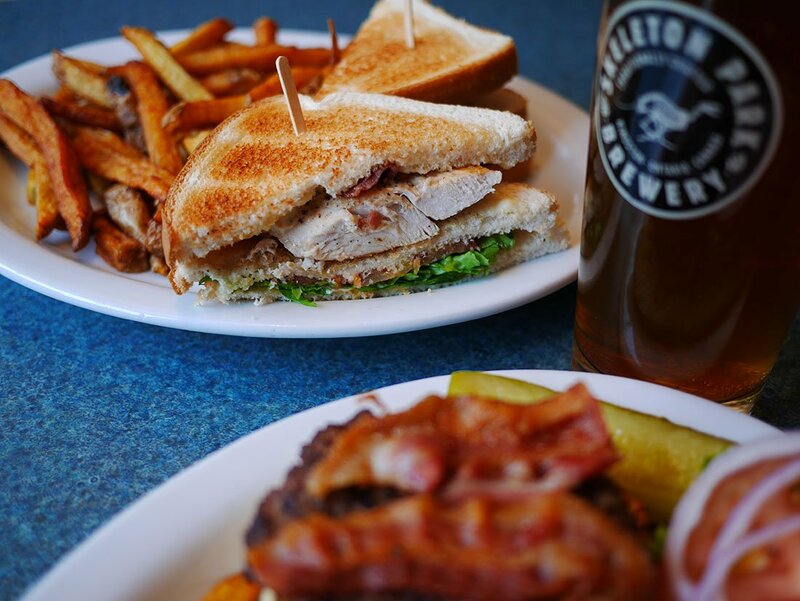 I went with the grilled chicken club sandwich which sported a generous portion of grilled breast meat, bacon, lettuce and tomato. It was as good as it sounds, especially when paired with a nice cold pint of Ontario craft beer. Both of our plates came with a heaping portion of delicious thick-cut pub fries that really hit the spot. The great food, service and atmosphere of The Old English Pub, easily make it a must-try for visitors to Downtown Gananoque and new personal favourite. 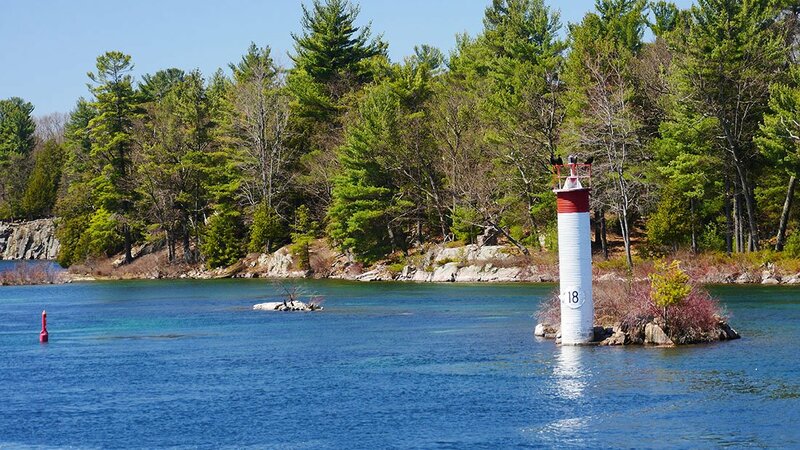 Next up, we took a short but visually stunning drive along the picturesque Thousand Islands Parkway. The sunroof was open, the windows were down and the waterfront views were mesmerizing as we cruised our way East. This picturesque driving route is not only for motorists, however. 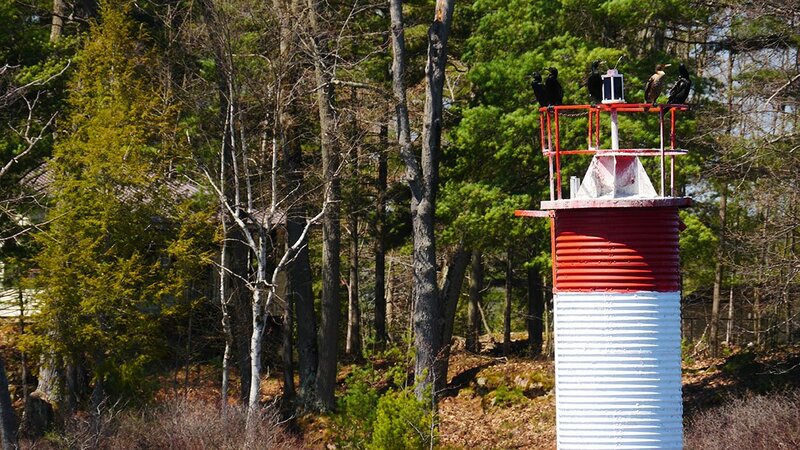 The parkway also sports a segregated and paved bicycle path presenting travellers with multiple options for exploring this remarkable route along the St. Lawrence river’s North Shore. 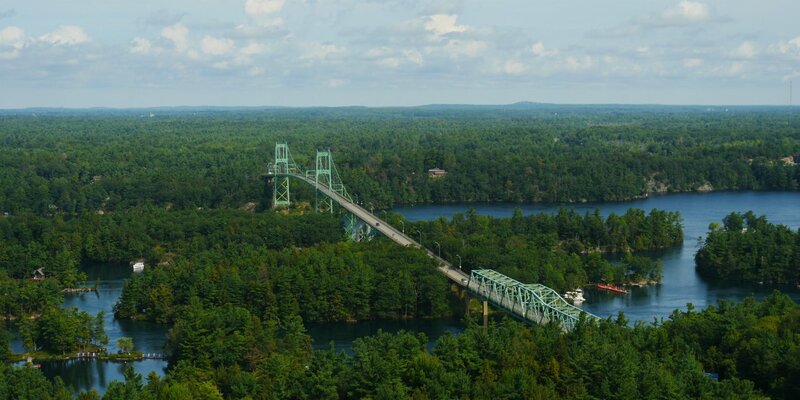 After a short 15 minute drive along the parkway, we crossed the 1000 Islands Bridge to pay a visit to Hill Island Ontario, and experience some panoramic views from a particularly elevated perspective. 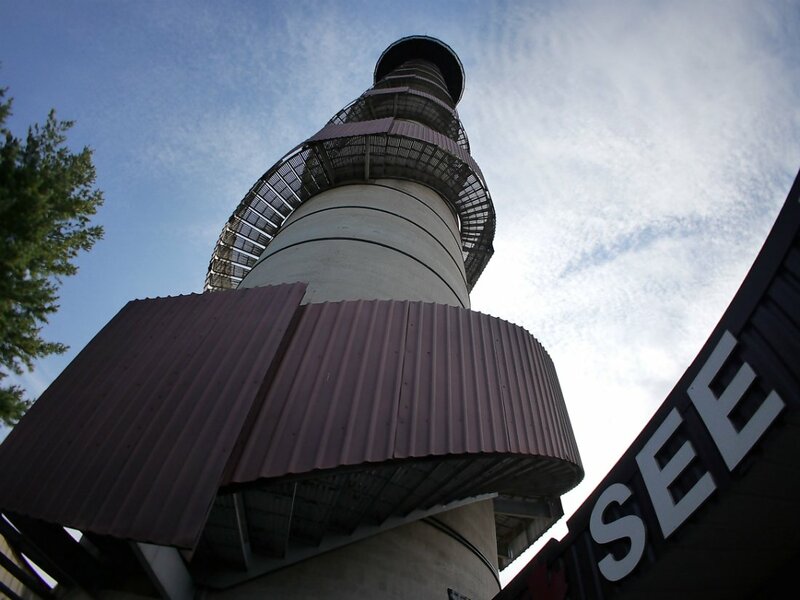 Reaching an impressive 400 feet above the surface of the Island is none other, than the famous 1000 Islands Tower. This magnificent spire has stood as an iconic and unique landmark since the 1960’s, situated adjacent to the USA-Canada border. Since being built, hundreds of thousands of visitors have stopped to ascend the tower and marvel at the view. 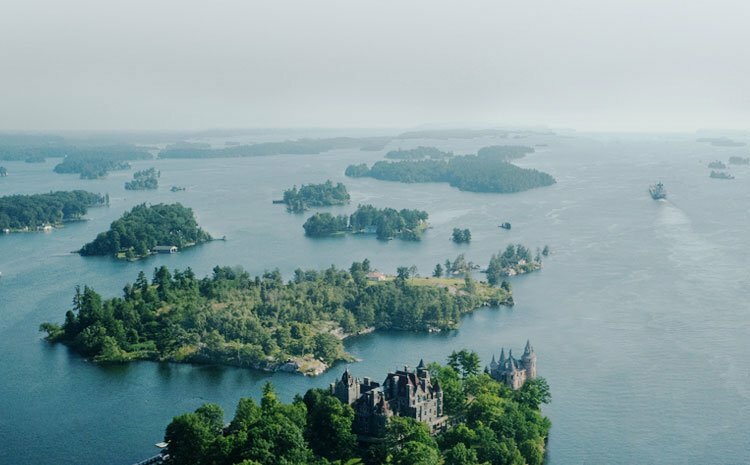 Once stepping off the elevator you’re met with a truly breathtaking sight as the sprawling landscapes of the 1000 islands stretch in every direction, for as far as the eye can see. The tower offers three observation levels, making this an ideal destination for photographers and shutterbugs who want to capture some timeless images or post a few mindblowing Instagram shots. What’s more, there is always a knowledgeable tour guide attending the Skydeck who is happy to speak with guests and explain the various features and attractions throughout the region. 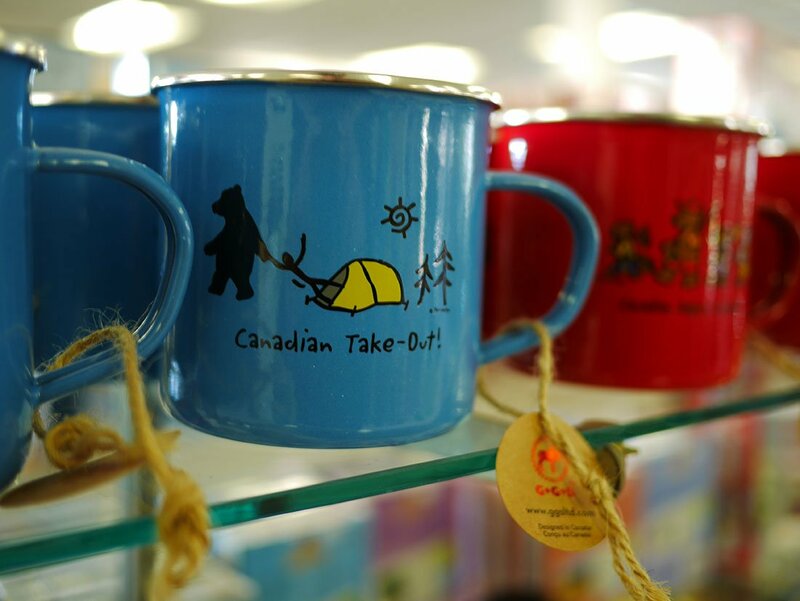 After returning to ground level, it’s always fun to browse through the tower’s impressive gift shop where you can find a vast selection of keepsakes, t-shirts, clothing and unique mementos of the 1000 islands. 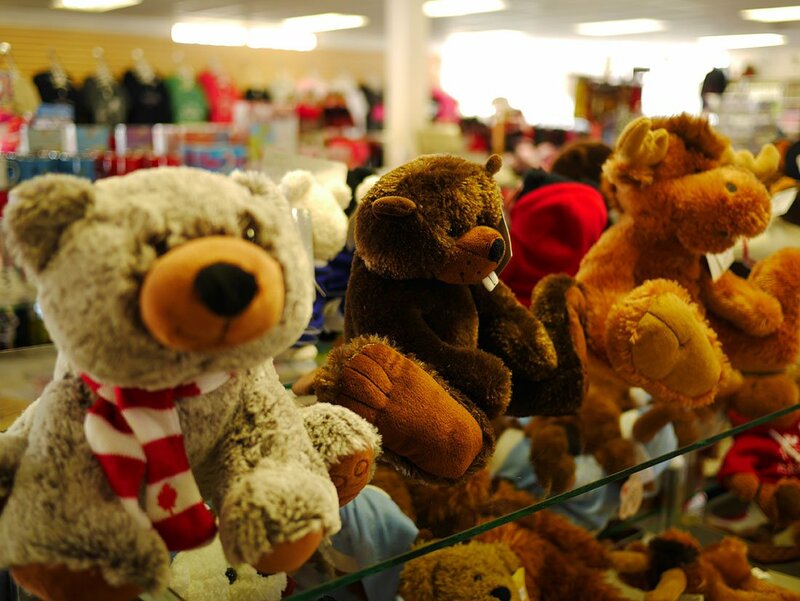 You’re sure to find several goodies to bring home as gifts or interesting additions to your own collection of souvenirs. The gift shop also has a fantastic ice cream shop, which has become something of a tradition for both travellers and locals alike. A stunning view from the Skydeck and a cold treat at the ice cream shop are pretty much an unspoken right of passage for visitors. After our visit to Hill Island, we made our way back to Gananoque for one last stop to visit The Thousand Islands Boat Museum. 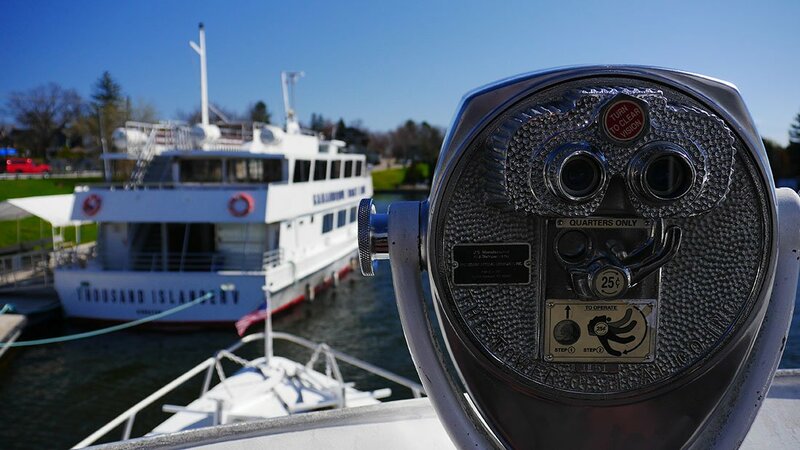 Located on the waterfront, the Thousand Islands Boat Museum provides a fun and interactive experience for visitors of all ages. 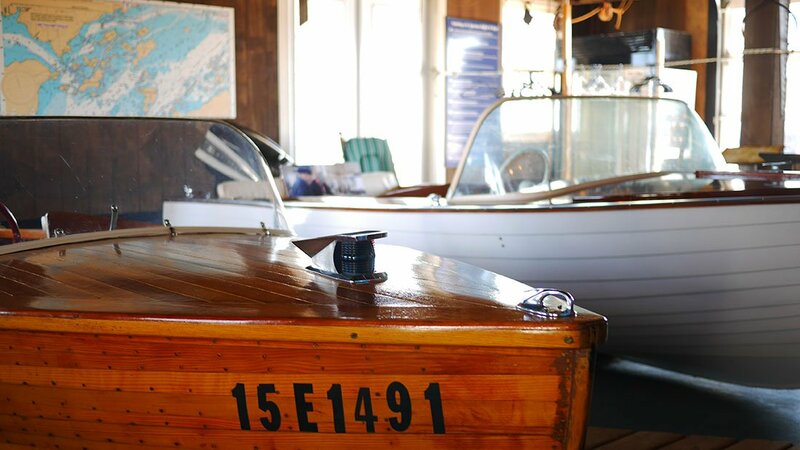 Here you will find an impressive selection of vintage wooden boats that speak to a refined era of leisure and pleasure boating on the St. Lawrence. 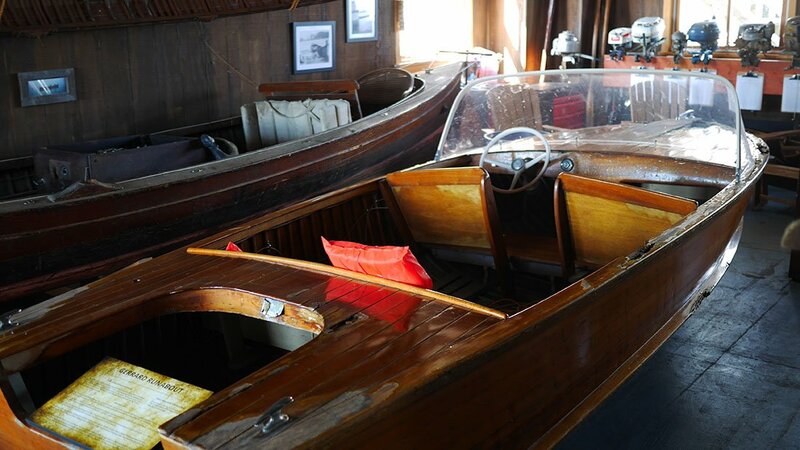 The museum proper sports a detailed boat building shop along with a hands-on children’s activity centre for little explorers. The entire museum comprises four buildings that house additional workshops and engaging youth-outreach programs. 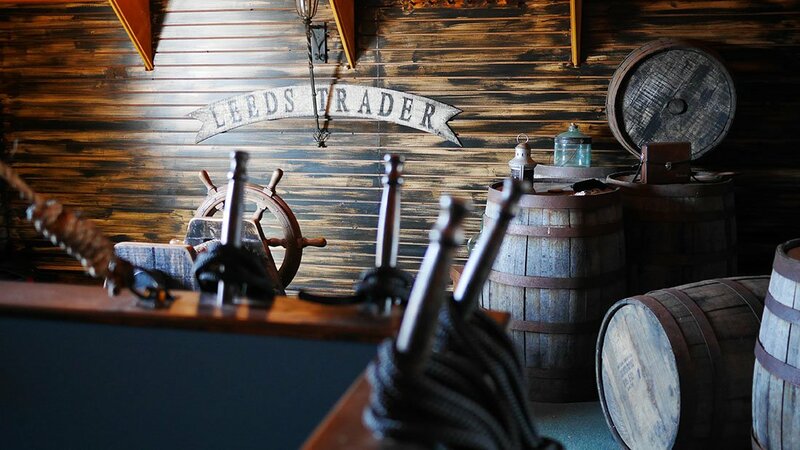 The greatest portion of the museum’s collection is showcased on the docks outside as fascinating live exhibits. While the sleek fibreglass hulls of modern boats are certainly pleasing to the eye – nothing compares to the shimmering beauty and smooth handcrafted contours of the vintage boats of yesteryear. 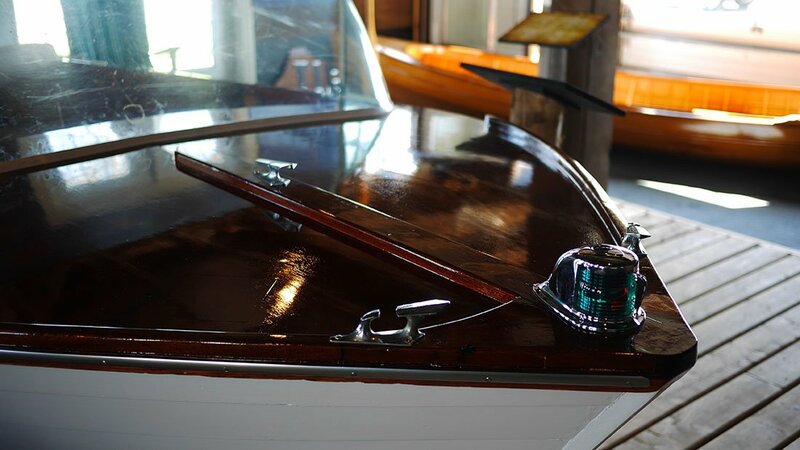 Each vessel in the museum’s collection is each a unique work of art that was created with dedicated craftsmanship using techniques from the golden age of wooden boat construction. 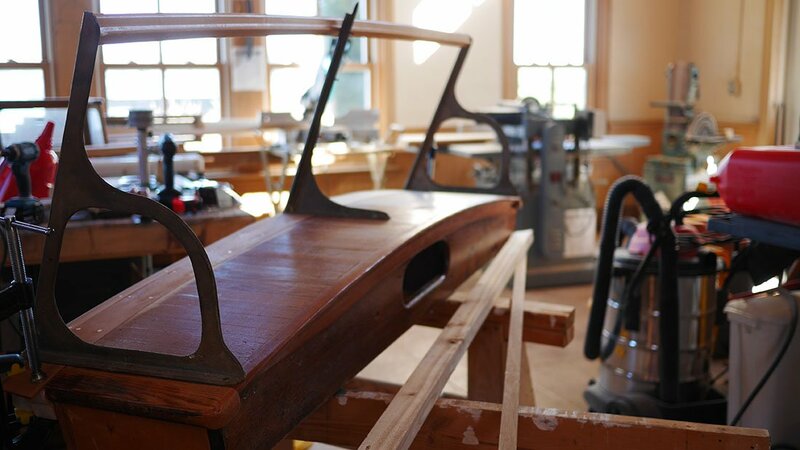 There were no laser-levels, or digital design programs back then, meaning that a master boat builder had to rely on precise manual measurements, careful cuts – and their raw instincts to produce a quality vessel. 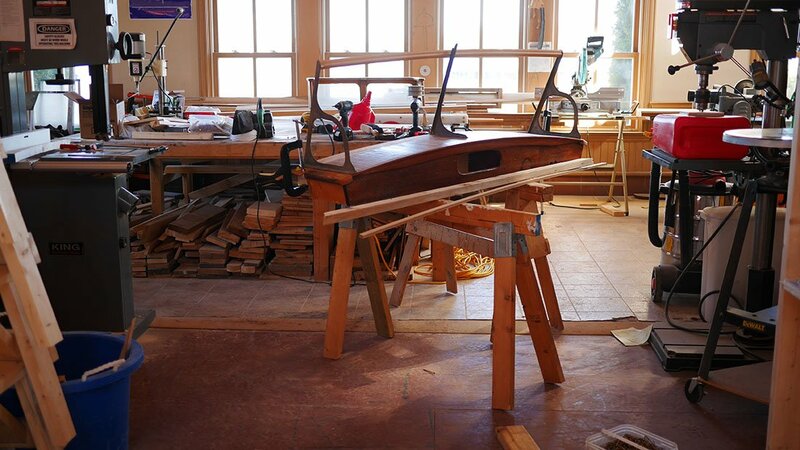 While this artisan technique of boat building is a niche market today, the vibrant spirit of the 1000 Islands and timeless story of life on the river are indeed alive and well at the Thousand Islands boat museum. 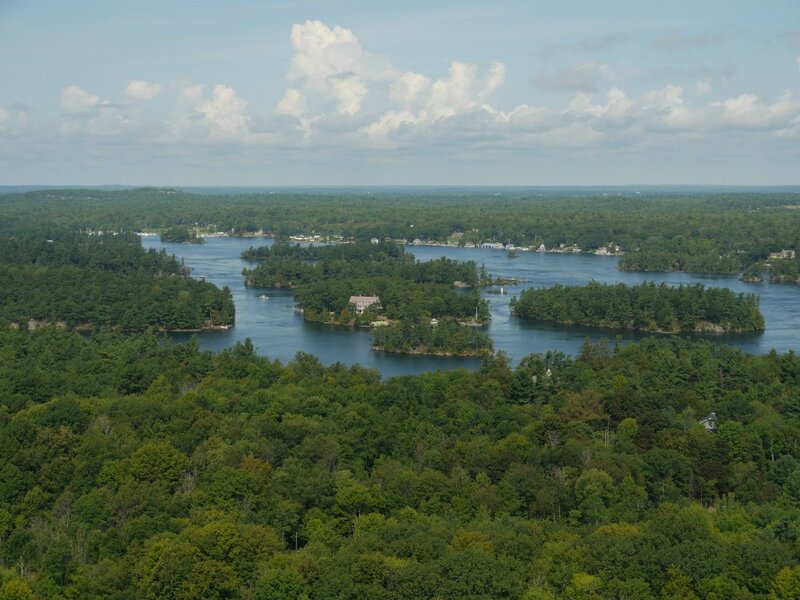 Explore The Heart of The 1000 Islands! 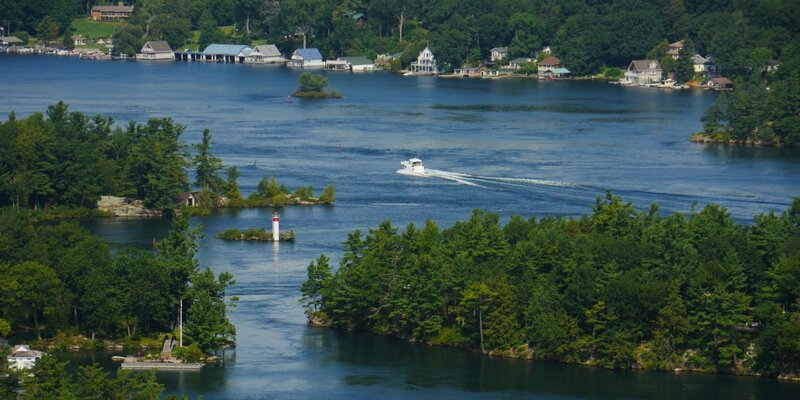 Whether you’re out on the water, enjoying a scenic drive, or high above the ground, there is no shortage of amazing ways to explore The 1000 Islands. 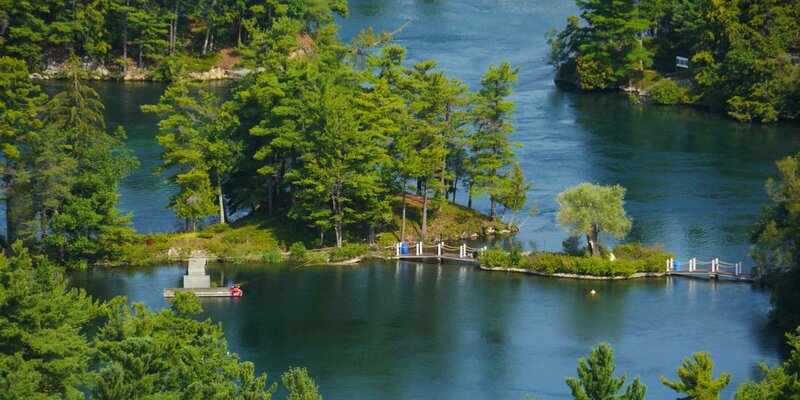 Gananoque is an excellent riverside town nestled in the very heart of the region – and surrounded by a limitless opportunity to forge lifelong memories. 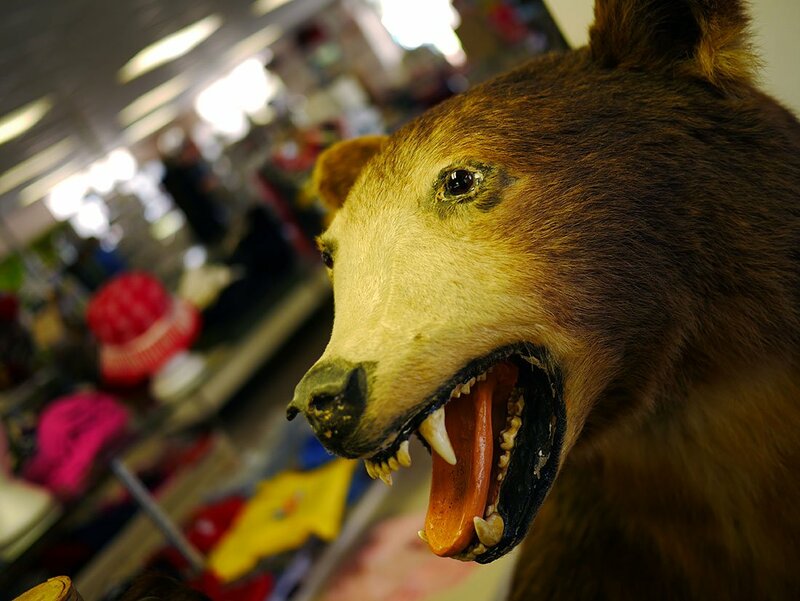 We hope you enjoyed our latest story! Don’t forget to check out the attached Google Map to track our route and start planning your own adventures!